Within the Email preferences section of the Email settings and log tab on a contact record, an administrator can change whether a contact receives emails, which types of email the contact is subscribed to, and change the frequency of forum update notifications. The administrator can also disable the delivery of all emails, including automatic system emails, to the contact. Click to choose which types of email you want enabled or disabled, using the options below. 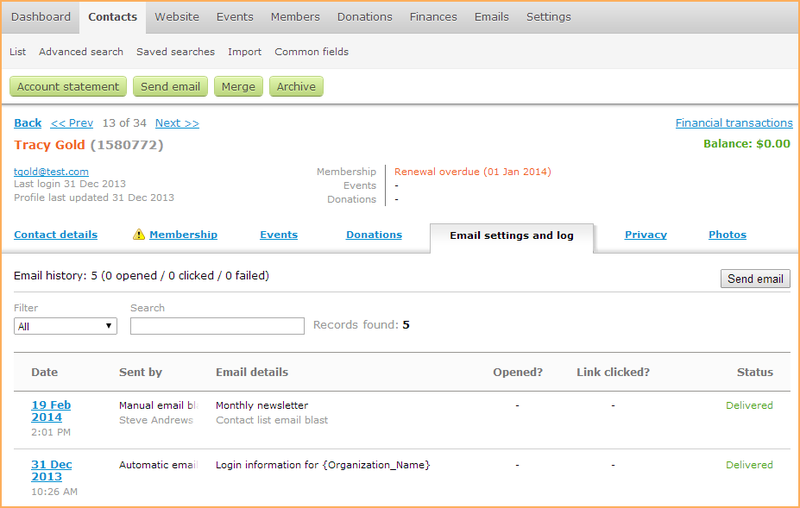 Click to disable all emails, including automatic system emails such as membership renewal reminders, event registration confirmations, invoices, and payment receipts. The contact has given their consent to receive emails from your organization. The contact can subscribe to specific types of messages, like event announcements and email blasts. The contact has expressly withheld their consent to receive emails from your organization. They will still receive confirmation emails in response to specific actions on their part, such as membership renewal notices or event registration confirmations, but they will not receive event announcements and other email blasts. The contact has not yet chosen whether to consent to receive emails from your organization. Workflow emails – automatic system emails such as renewal reminders, event registration confirmations, invoices, or payment receipts – cannot be disabled for a contact without disabling all emails, using the option above. Check to allow this contact to receive event announcements and reminders. This option is only available if the Send emails per settings below option is selected, and the contact has not opted out of receiving messages from your organization. Check to allow this contact to receive manual email blasts. This option is only available if the Send emails per settings below option is selected, and the contact has not opted out of receiving messages from your organization. Click the check boxes to enable or disable forum update emails, and change the frequency of the emails by selecting an option from the drop-down list. Forum subscription options only appear if the contact has subscribed to forum update emails from a forum page. When you are finished updating the contact's email preferences, click Save. Visitors to your site can sign up to receive newsletters, updates, or other mass emails by filling out an email subscription form. Signing up for email subscriptions is separate and distinct from the process of subscribing or unsubscribing to certain types of emails. To view which email subscriptions a contact is currently signed up for, look under Subscription sources on the Email settings and log tab of the contact record. To change the subscription sources for a contact, click the Edit button. On the screen that appears, check the sources you want to subscribe the contact to. To view a contact's complete email history – a log of all emails sent to the contact from your site – see the Email history section at the bottom of the Email settings and log tab. This section will only appear if the contact has been sent emails from your Wild Apricot site. For each message, the email history will display the date of the message, who the message was sent by (and whether it was a manual or automatic email), and the details of the message, including its subject and its source. The status of each email – whether it was delivered or failed to be delivered – appears under the Delivery column. If email tracking was enabled for a particular message, the email history will indicate whether each recipient opened the email and which links were clicked. 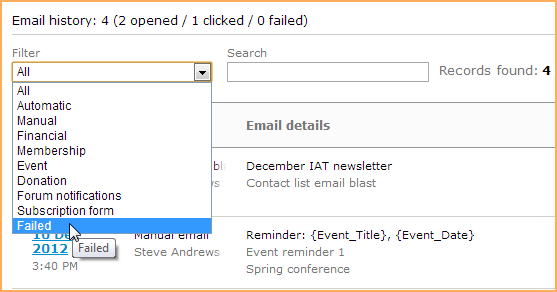 To filter the email list to display only certain kinds of messages – automatic, manual, failed, etc. – click the Filter drop-down and select an option. To perform a keyword search, enter a search string in the Search field.